Here are some ideas for getting started. The sequence may vary according to your situation. a. Immerse yourself in the Canadian Cohousing Network website. Read about us, about cohousing, look at our resources directory, check out all the forming and existing communities linked on our communities page, learn what to do if you’re interested and how to contact us. b. Discover cohousing through a DVD, books and other audiovisual resources. a. Share your ideas and enthusiasm with everyone. b. Encourage others to share what an ideal community means to them. c. Invite people to share their ideas online as well as in face-to-face meetings. d. Launch a Meetup group to discuss peoples’ ideas for an ideal community. a. You don’t have to know all the answers; it’s cooperative learning. c. Bring people together to watch these presentations with you. d. Ask people what they like about the cohousing concept. e. Record everyone’s ideas for their ideal community. f. Schedule more meetings … decide together on future meeting agendas. Each cohousing community has a unique size, location, architectural style and vibe. Visit established communities to inspire your forming group and ground your visions in reality. Each community has a website with its tour details. How you facilitate meetings and manage decision-making strongly influences who will stay involved. Learn and practice consensus decision-making protocols and processes. See: treegroup.info Group Works groupworksdeck.org for resources. Building your community starts long before construction begins. a. Give a warm welcome to everyone who attends your meetings. It takes time for people to get to know each other and to realize that their varied visions may be accommodated under one roof. It takes all kinds! c. Start right. Use sustainable decision-making protocols and practices at every meeting. Clarify and articulate your intention, vision and mission. Create written statements with which you can all agree. See Tree Bresson’s website for information and suggested exercises. a. Identify who’s willing to spend their time, energy and money to create your community. b. Collect a small fee to cover meeting expenses such as food, child-care, room rental. c. Open a bank account. Keep expenses low as there’s no guarantee yet of a development. a. Select a geographical locale and determine if your members can afford to live there. b. Work with a realtor to identify some possible sites; talk with a planner at your local municipality re: zoning to find out what land use designations could support a cohousing development. a. Once you find an acceptable site, your best next step is to hire a professional to help you prepare a feasibility study. The feasibility study is a critical starting point for the development that should clearly identify challenges, opportunities and next steps for moving forward. It should include a financial plan and development pro forma that estimates the cost for a home in the completed community. Cohousing professionals can include architects, developers, facilitators, development consultants, marketers, trainers, and others. 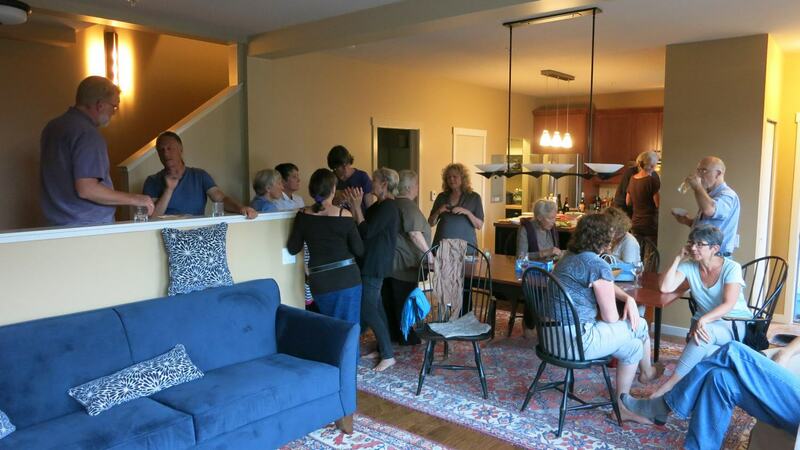 The Canadian Cohousing Network has several professionals among its members. Discover how they may assist your progress. b. Canada Mortgage and Housing Corporation (CMHC) has a Seed Funding Program that grants financial assistance to carry out the initial activities required to develop a proposal for an affordable housing project that will result in increasing the stock of affordable housing in Canada. Although cohousing is not necessarily affordable housing, several cohousing groups have successfully developed some units in their communities as non-market affordable housing and have qualified for Seed Funding to help them achieve that.